A School of Healthcare Sciences student from Bangor University is looking forward to represent Anglesey in an inter-island competition this summer. Ryan Booth, who is on his third year studying Diagnostic Radiography and Imaging at the Archimedes Centre, School of Healthcare Sciences in Wrexham, will compete in the NatWest Island Games XVI which takes place in Jersey between 27th June and 3rd July. The 2015 Jersey event will feature around 2,900 athletes, with 24 islands taking part. Ryan, who is from Trearddur Bay, Anglesey will be part of the football squad playing against Guernsey, Gibraltar and Gotland in the group stages. The 21 year-old is no stranger to being involved in competitive sports, having played football for various Anglesey teams from a young age. 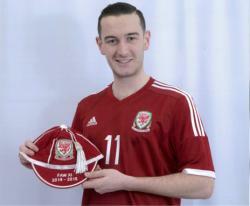 Ryan progressed and played for the North Wales Regions Cup side, against the other counties in Wales. After winning the league, Ryan went on to represent Wales in the UEFA Regions Cup in Estonia in the summer of 2014. Ryan is currently training to prepare for the NatWest Island Games which will commence on 27th June for one week. More information about NatWest Island Games XVI here.